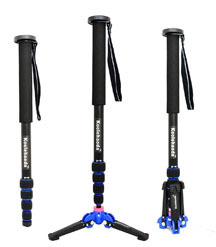 The Koolehaida monopod has folding feet and cost around $50. The feet lock into open position fairly securely and supports my Canon 5d Mark III along with a 70-200mm f/2.8 lens. 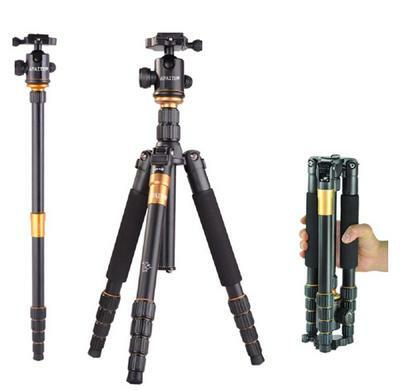 The consolidation of camera tripods and monopods into one single accessory to carry seems to be becoming more popular. Designs have improved a lot over the last 9 years. Rather than just a geeky attempt at making something new, designers have actually built in valuable features that serve photographers. Monopods with feet are not nearly steady enough to use like a solid tripod. Small point and shoot cameras and cell phone cameras with an adapter are fine, particularly if you don't extend the legs much at all. Join in and write your own page! It's easy to do. How? Simply click here to return to Opinions on a monopod-tripod combo. One of the readers of Better Digital Photography Tips purchased a combination monopod/tripod marketed by AFAITH® so I wanted to pass it on to you as another option. This would make a good travel tripod because of the unique folding legs on the tripod. Click on the photo below for the consumer reviews on Amazon for now. Check back soon for my full review.